Is there anyone out there who’s interested in musical theatre that hasn’t seen “Wicked”? It’s been running at the beautiful art deco Apollo Victoria since September 27th 2006 – that’s over 3700 performances (and that’s not counting the UK tours) – with numerous regular changes of cast and last night I got to see the latest. So what’s appeal of this multi-award winning show and the reason for its longevity? I think it’s down to the fact that the producers have tapped into a demographic that a few years ago didn’t really go to the theatre – teenage girls, many of whom see the show not just once but many times over. They’re drawn to a story they can relate to – a story of two feisty young women, one perfect, one not so perfect and their friendship as they embark on a journey that sees them loving the same man, breaking up as friends and getting back together – what teenage girl doesn’t empathise with this? For anyone reading this review who hasn’t seen the show (is there anyone? ), then the premise of “Wicked” is that it’s prequel to the “Wizard of Oz” and tells the story of how “Galinda” later to become “Glinda The Good” and of “Elphaba” who becomes “The Wicked Witch Of The West”. The twist is that when they meet “Galinda” is the nasty, stuck-up, self-centred one and “Elphaba” is the good one having lived a tough life being rejected by her father because she’s green and having to spend her time looking after her sister Nessarose who’s an invalid. It recounts the story of how they meet at university and how they each affect each other’s lives causing them to become the characters we know so well from the 1939 MGM film. And speaking of the film, there are a number of lines in the show that deferentially refer back to it such as “Lemons and melons and pears – oh my” (instead of “Lions and tigers and bears”) and “There’s no place like home”. We also find out why the Tin Man has no heart, why The Lion became so cowardly and how The Scarecrow became a scarecrow – although if you analyse it carefully, the timescale doesn’t quite stack-up! It’s a very clever concept and it’s a spectacular production with some of the best sound and lighting design I’ve ever heard and seen – either here or on Broadway. There are giant roaring dragons, flying monkeys and a witch defying gravity (but only one Munchkin and he’s not that small!) If I do have one criticism of the staging, it’s the scene where Elphaba as “The Wicked Witch” gets her come-uppance. It’s the same dénouement as in the movie and involves a bucket of water and some melting but after all the spectacle and the special effects that went before, it’s carried out as a shadow play behind a curtain that Elphaba draws across the stage for no obvious reason. As I said this is a new cast and there are some superb performances. Emma Hatton is wonderful as “Elphaba” stepping into the very big shoes (as have many others) of Idina Menzel. Hatton sings like a dream especially in the show-stopping “Defying Gravity” which brings the first act to a thrilling climax. Savannah Stevenson is excellent as “Glinda” although she was a little bit shrill on some of her high notes. This may have been because the 17-piece band was extremely loud and the whole show was a little over amplified. Also doing sterling work was American Broadway and TV star Tom McGowan as the “Wizard of Oz” and Katie Rowly Jones returning as “Nessarose” having originated the part when the show opened in 2006. Steven Schwartz’s music and lyrics are inspired and fit marvellously with Winnie Holzman’s ironic, witty, erudite and often self-deprecating book. It’s not often in a musical that the book is as good as the songs but in this case it definitely is. So if you’ve been living like a hermit for the past 9 years or you just haven’t gotten round to it, now’s the time to go and see “Wicked”. It’s a superb cast in a spectacular West End show – what’s not to like! Expect some wonderful singing and dancing, some very funny lines, some terrific songs – just don’t expect loads of Munchkins. 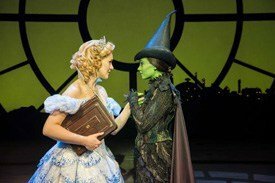 Winner of 90 international awards, Wicked has cast its magical spell over audiences of all ages across the world for a decade and continues to be a record-breaking hit at London’s Apollo Victoria Theatre. 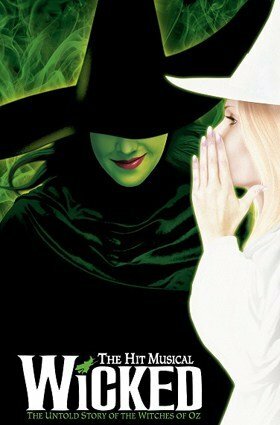 Based on the acclaimed novel by Gregory Maguire that re-imagined the stories and characters created by L. Frank Baum in ‘The Wonderful Wizard of Oz’, Wicked tells the incredible untold story of an unlikely but profound friendship between two girls who first meet as sorcery students. Their extraordinary adventures in Oz will ultimately see them fulfill their destinies as Glinda The Good, and Elphaba the Wicked Witch of the West.